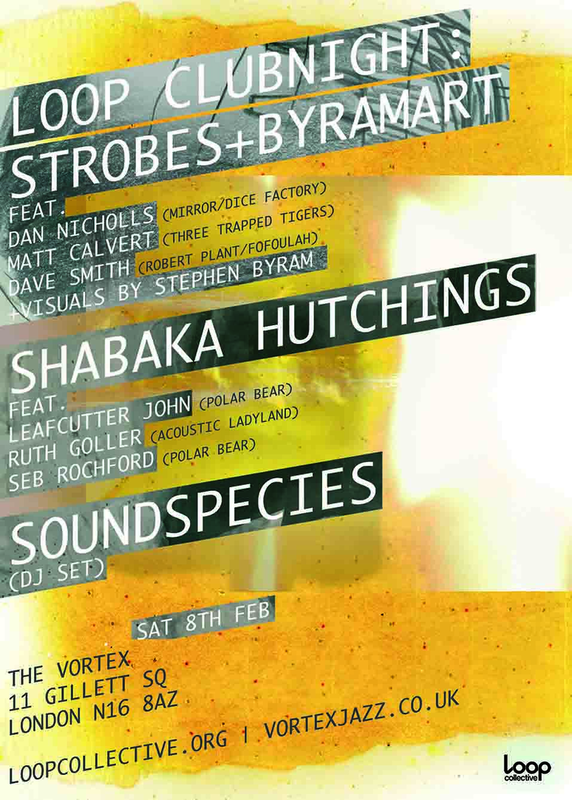 February 8th marks the next in an ongoing series of Loop Collective Club Nights at The Vortex in Dalston. 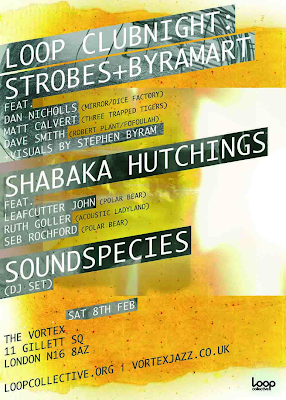 These nights have been a real success, showcasing groups which bring together eclectic influences – from African musics to electronica to improv – in front of big crowds and making use of The Vortex late bar with DJ sets from Soundspecies. This upcoming night is a quadruple bill, starting at 8.45pm with a very exciting new project led by percussionist Bex Burch, who lived in Ghana for three years where she studied traditional Gyill music. The group plays arrangements of Ghanaian music featuring Tom Challenger, Dave Smith, Jim Hart, Simon Roth and myself, with Bex playing a specially adapted xylophone which is amplified to create a sound reminiscent of Congolese bands such as Konono No.1 and Kasai All Stars. The next act is Mobo Award-winning saxophonist Shabaka Hutching's quartet featuring the electronic wizardry of Leafcutter John (Polar Bear) and the fantastic drums and bass partnership of Tom Skinner and Ruth Goller. This will be a rare opportunity to see four of London's finest playing together. Next up is my own project Strobes+ByramArt which sees my group Strobes – with Matt Calvert (Three Trapped Tigers) and Dave Smith (Robert Plant, Fofoulah) – join forces with one of my heroes of visual art, Stephen Byram, who designs the cover art for Tim Berne's Screwgun label amongst a multitude of other work. The set will include visuals which are heavily integrated into the live music through the use of triggers and computer software. The night will be finished off by a DJ set from Sounspecies' Ollie Keane – who never fails to play some of the hippest music from Africa and further afield – and a late bar.